Natural chair cane is used in hand weaving a seat or back on chairs that have drilled holes in the frame. The method consists of weaving strands of cane through these drilled holes in the frame to form the desired patterns. The natural color variation, yellow to tan makes for a beautiful and natural hand worked effect. The binder cane is included with the hanks of cane. You can also purchase our superior quality cane in kits. 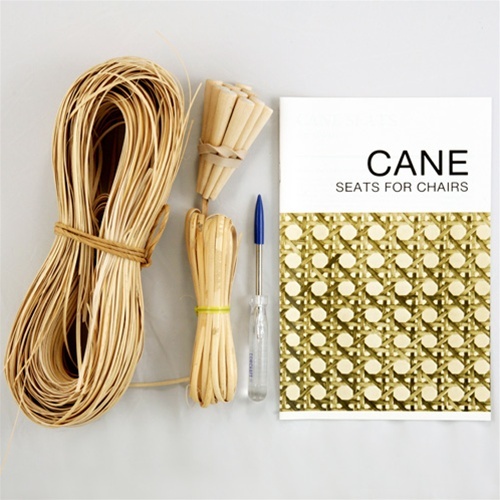 All kits come complete with cane, 4MM binder, caning pegs, caning awl, and the instruction booklet "Cane Seats for Chairs". They are available in 250', 500' and 1,000' hanks. The size of cane needed is determined by the diameter of the drilled hole, and the distance between these drilled holes center to center. A 250 foot coil will weave an area of about 12" x 12" with 72 holes or less. A 500 foot hank will weave about two areas of 12" x 12" and a 1,000 foot hank will weave four areas. 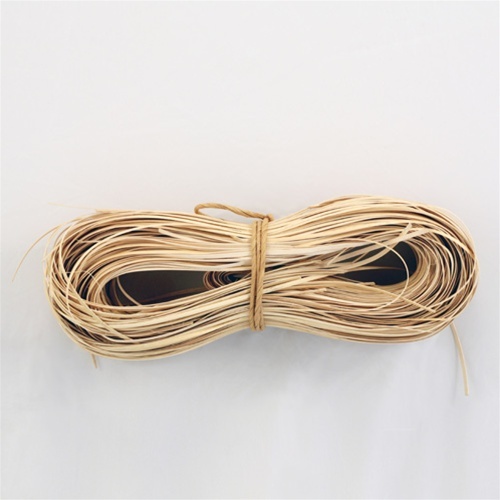 All cane is of superior quality, freshly cut from rattan, with strands 8 feet or longer. The 250-foot coil is usually made up of strands 8-foot or shorter for the benefit of beginners. 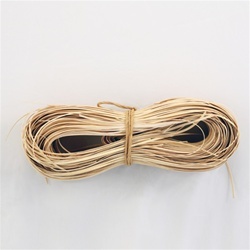 4MM binder cane included in coils and with hanks of cane. 1.5 mm Carriage 1/8" 5/16" - 3/8"
1.75 mm Superfine 1/8" 3/8"
2 mm Extra Fine Fine 3/16" 7/16" - 1/2"
2.25 mm Fine Fine 3/16" 7/16" - 1/2"
2.5 mm Fine 3/16" 1/2" - 9/16"
2.75 mm Narrow Medium 1/4" 9/16" - 5/8"
3 mm Medium 1/4" 5/8" - 3/4"
3.5 mm Common 5/16" 3/4" -7/8"